Samsung Galaxy Note 8.0 ushers a new era of portability and productivity wherein organizing, multi-tasking and de-cluttering are key factors to achieve mobility. Its slim and compact design perfectly fits in Bianca’s handbag. Handy as it may seem, it is a powerful gadget that lets Bianca update here close to 2,200,000 Twitter followers, check her emails, keeps track of her hectic schedule, browse the internet to get inspiration for her articles, read her favorite e-book, and jot down notes instantly. She can even do all these tasks simultaneously as Samsung Galaxy Note 8.0 allows multi-window display. A writer by heart, Bianca particularly loves the improved S Pen and S Note features as these allow her to compose and share her articles with so much ease. The S Pen feature is optimized to bring out creative expressions, while giving the feel of actually writing down on a piece of paper. With the S Pen, Bianca can write memos, crop and embellish photos, browse the Internet, and even make an entry on her diary. What’s more, the S Pen can now be used without actually touching the screen through the advanced Air View technology. The S Pen needs only to hover over the screen to preview pictures, videos, and e-mails without opening the file or application in full. Samsung Galaxy Note 8.0 also allows Bianca to read to her heart’s content. The device intelligently calibrates itself to provide optimal conditions for prolonged reading through the Reading Mode. Eye -strain is greatly reduced as it automatically adjusts brightness, color temperature, and contrast ratio depending on lighting conditions. Furthermore, it also has a unique eye detection feature so the device will never shut off while reading, while the S Pen allows for making annotations and marks on the actual page. Bianca also finds the Digital Diary feature very useful. The S-Planner allows her to manage her busy schedule on a daily and monthly basis, attach pictures or memos on specific dates to mark a special event, and even personalize entries to make it more fun and interactive. Of course, Bianca can never put aside the full phone functionality of her newfound gadget. For Bianca, nothing beats getting in touch with friends and loved ones through an actual conversation, which she can do with the Galaxy Note 8.0. 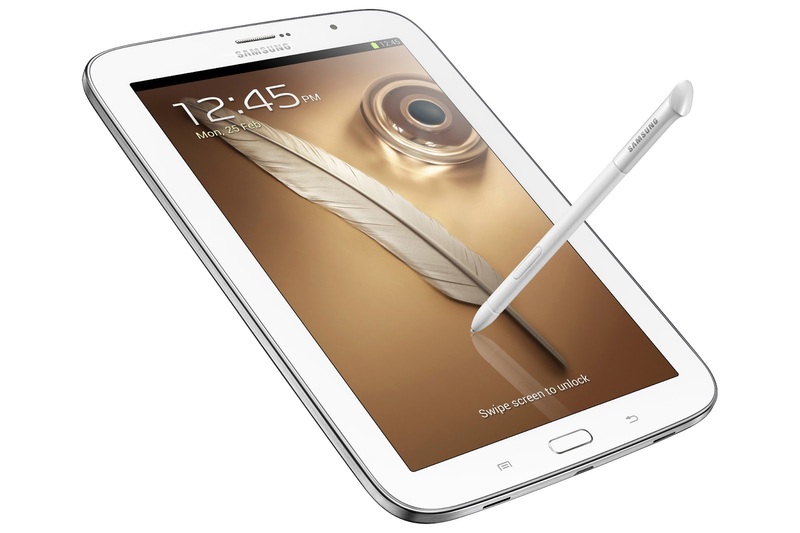 The Samsung Galaxy Note 8.0 hits Samsung stores on April 13, and as a special treat, Samsung is giving out exciting deals for new and proud owners of the latest device. A special first-day selling event will take place on the said date at the SM Mall of Asia - Atrium. Every buyer of a Samsung Galaxy Note 8.0 is entitled to a free Samsung book cover worth P1,699. Those who will line up from 10AM to 12NN will also get a free Samsung phone via raffle draw for every purchase of a Samsung Galaxy Note 8. Up for grabs are the Samsung Galaxy SIII, Galaxy Note 2, Galaxy SIII Mini, Galaxy Grand, Galaxy S Duos, Galaxy Y Reloaded, and E1200.